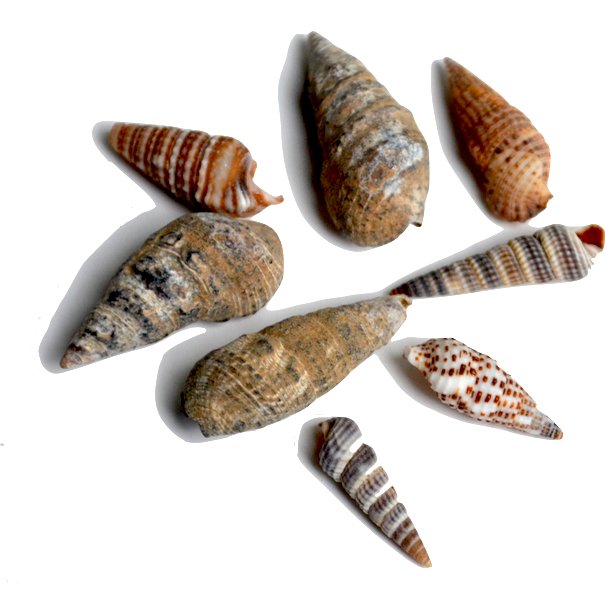 The seashells and fossils you will find during your Treasure Quest are from Africa and Asia. 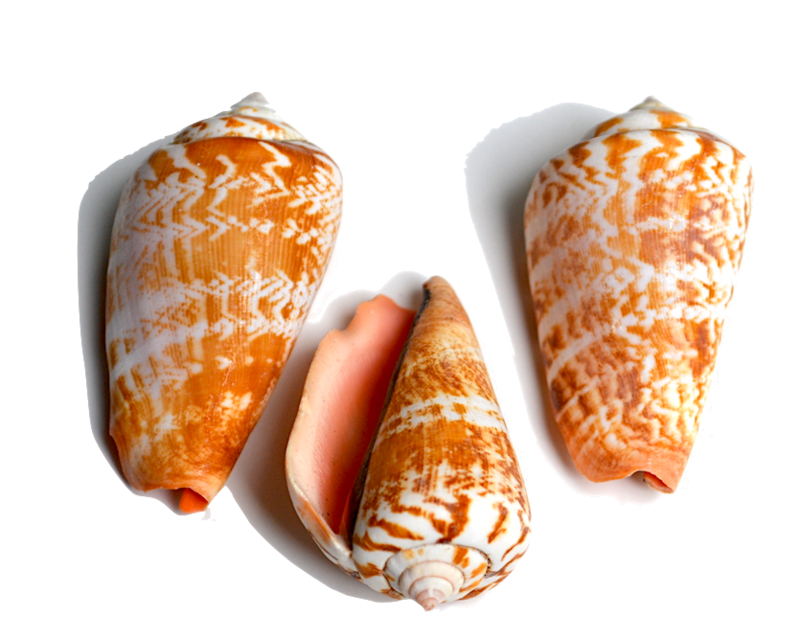 Our shells are from the Indo-Pacific region of Asia which includes the tropical waters of the Indian and Pacific oceans. 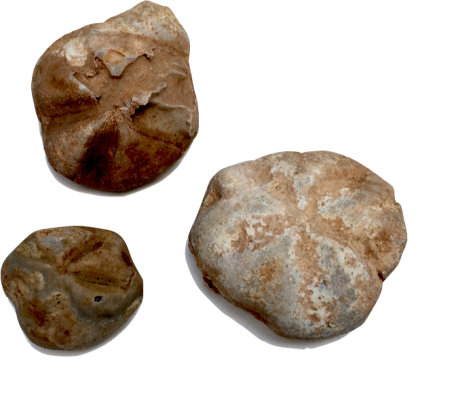 Our fossils are from the Sahara Desert in Morocco. This portion of Northern Africa was once covered in water and is rich in marine-life fossils from the Cretaceous period (145.5 – 65.5 million years ago) through the Eocene periods (56 – 33.9 million years ago). We hope you enjoy learning more about your treasures! Abalone – The abalone shell is characterized by an iridescent sheen on the inside of the shell and is often prized for jewelry. 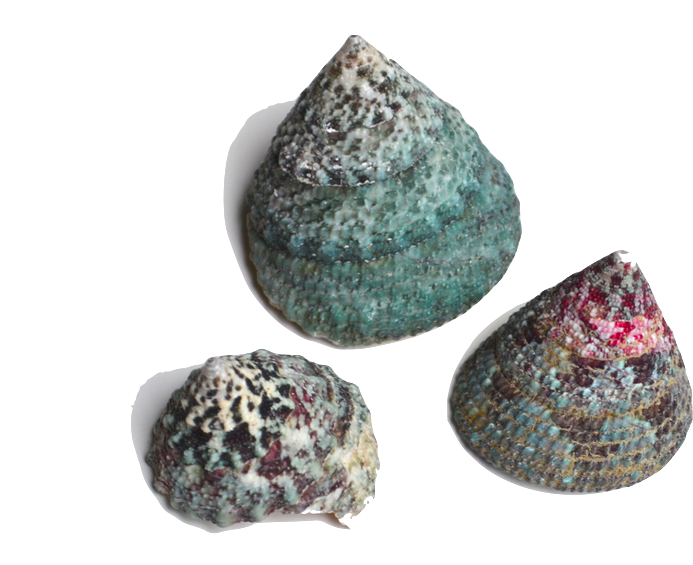 The iridescence is called nacre or mother-of-pearl. 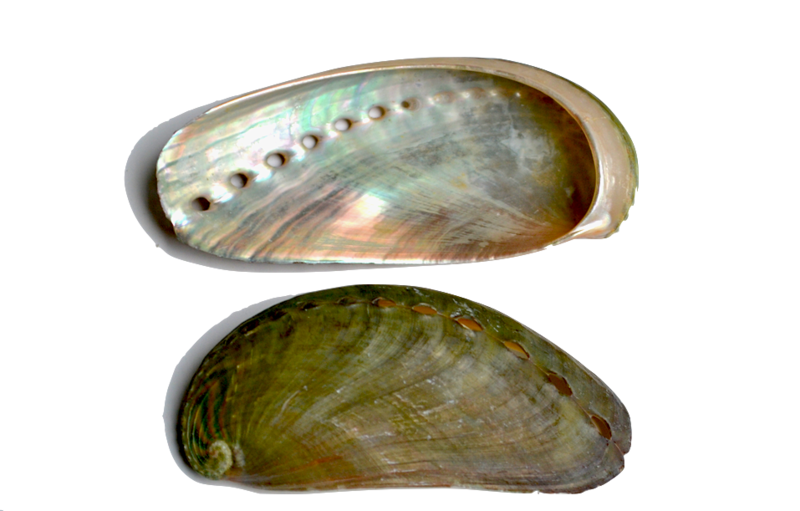 This species of abalone is called a “Donkey’s-Ear Abalone” because of its interesting shape. 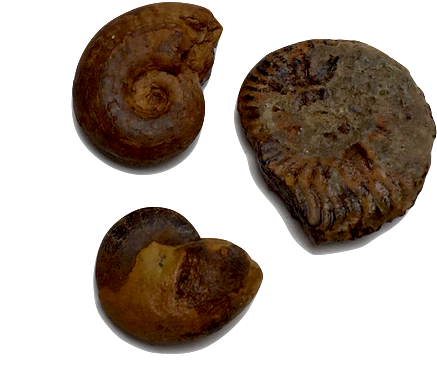 Ammonite – An extinct species of marine mollusk, the Ammonite is more closely related to the cuttlefish and octopus than the Nautilus. They used gas chambers within their shell to control buoyancy. They lived 240 to 65 million years ago. 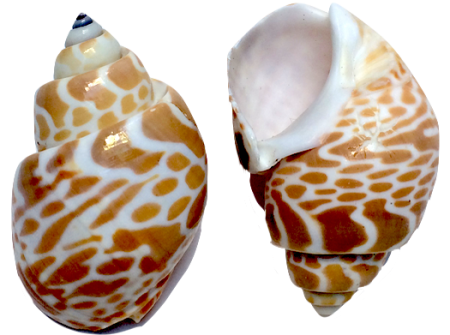 Babylon – These snails form plump shells spotted with brown markings and a well-defined whorl (spiral). 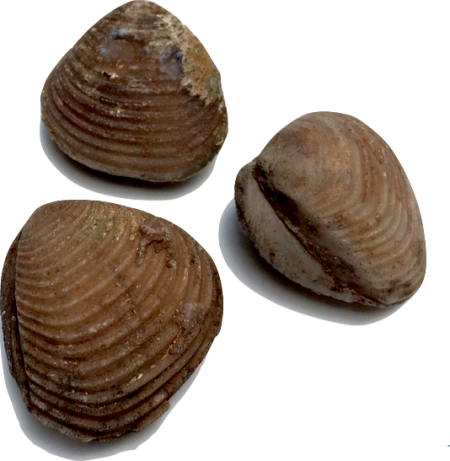 Bivalve – A bivalve is a mollusk that has two shells connected at a hinge by a ligament and closed by muscles. 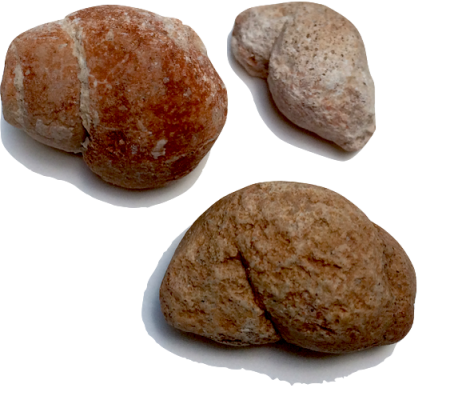 The ligament, made of organic material, is rarely preserved in fossils. 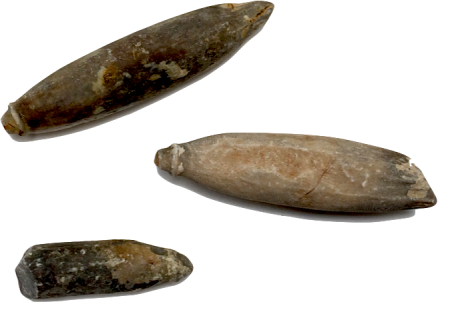 Bivalves would burrow into the sediment, bore into stone, or attach themselves with a filament. Clams, mussels, and oysters are bivalves. 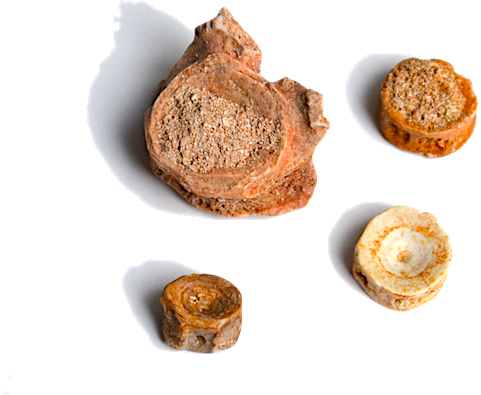 Bone Fragment – From time to time you will discover pieces of fossilized bone in your mining rough. While it’s hard to tell what type of animal they are from, one thing we do know is that they are millions of years old! 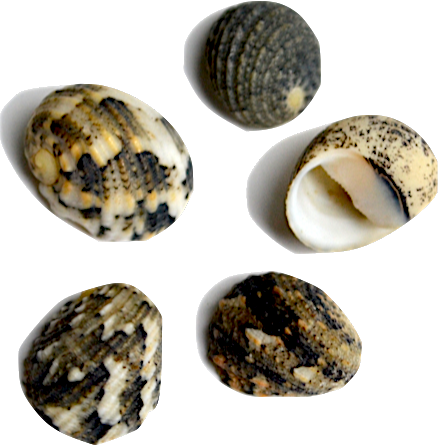 Button Top – These little animals live in sandy areas and have a smooth, flattened shell. They often have a speckled or banded pattern and range in color. They have a button-like appearance, hence their name. 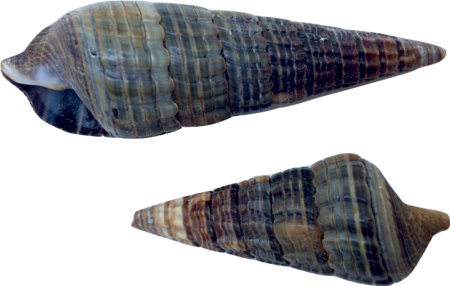 Cerith – These spiral-shaped shells are one of the more abundant shallow-water dwellers. There are so many varieties that it is often hard to identify the specific species. 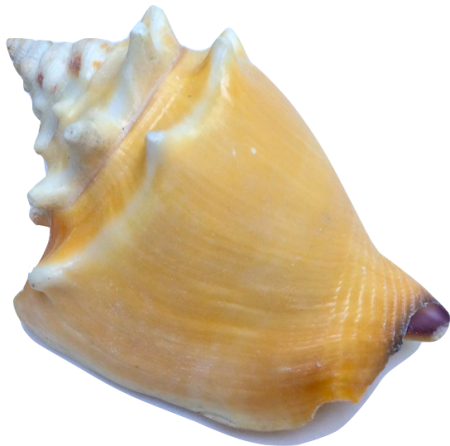 Conch – This family of shells is characterized by having a very distinctive shape. The shells come to a point on both ends. Cone – All animals in this family have shells that are conical in shape. 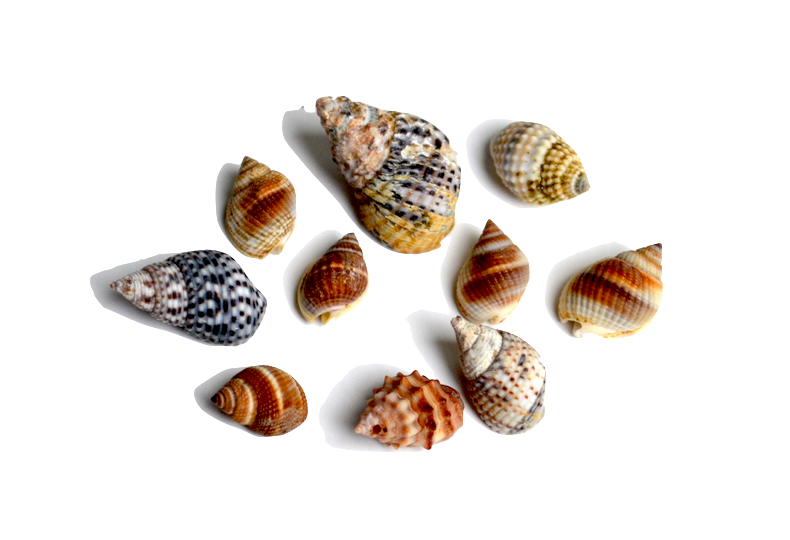 They are popular with shell collectors due to the wide variety of colors and patterns. 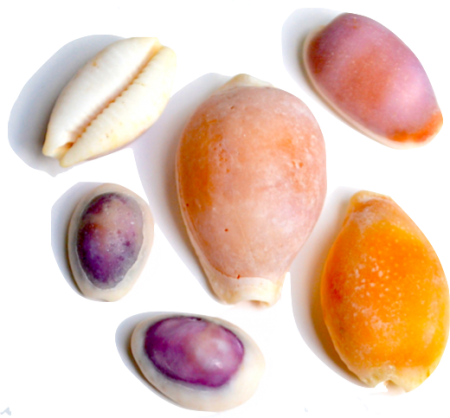 Cowry – There are over two hundred different species of cowries and all have the same basic shell structure. They are most known for their glossy appearance, beautiful colors and “teeth” on the underside of the shell. They are nocturnal creatures and feed on algae in the coral reef. Crinoid Stem – Also known as Sea Lillies or Feather Stars, crinoids attached to the sea bed by a flexible stem. The stem is made up of disc-like plates called columnals. The cup at the top of the stem filtered food from the water. These pieces are from the animal’s stem. Dolphin – This small group of gastropods is characterized by its ornate and intricate shell. They are prized among collectors for their heavy ornamentation. 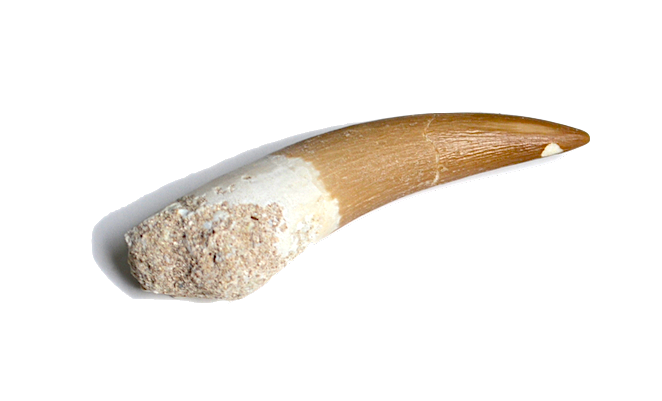 Elasmosaurus Tooth – The elasmosaur is a type of plesiosaur that lived in the Cretaceous period (145.5 – 65.5 million years ago). This long-necked marine reptile lived in the ocean and fed on fish and ammonites. On rare occasions, you may find fragments of an elasmosaur tooth in your Treasure Quest mining rough. 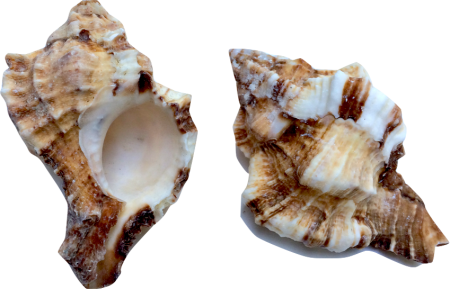 Fighting Conch – Named for the helmet-like appearance, these snails are voracious herbivores that burrow in the sand. 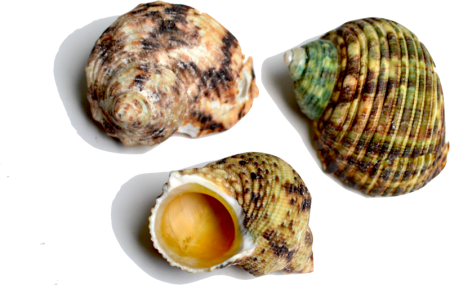 Gastropod – Gastropods are the largest class of mollusks (snails). They lived in a variety of habitats including marine, freshwater and on land. They had a head with eyes and a mouth, along with a flattened foot for crawling. Megalodon Tooth – The largest shark to have ever lived! This extinct species of shark could reach 59 feet in length – roughly three times the length of the longest great white shark. They lived 28 to 1.5 million years ago. Miter – A beautiful, ornate, spiral shell. These animals lived in the inter-tidal zone in the tropical Indo-Pacific region. 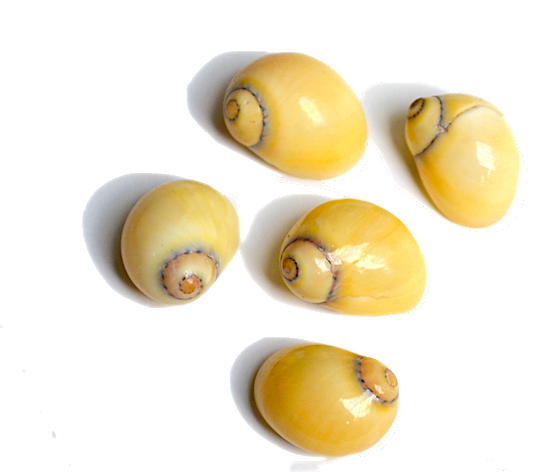 Moon Shell – The members of this family are commonly found on the sandy ocean floor and inhabit oceans around the world. 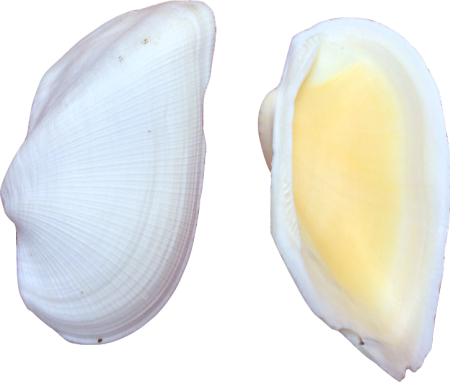 The opening of the shell, or aperture, is half-moon shaped. 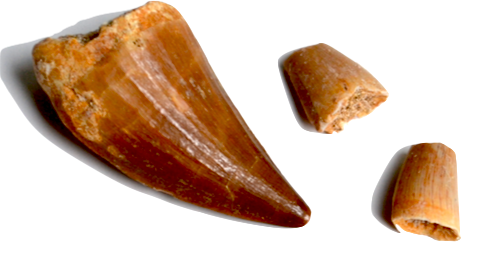 Mosasaur Tooth – The mosasaur family includes ocean-dwelling reptiles from the Cretaceous period. They became the dominant ocean predator following the decline of plesiosaurs. You may more commonly know of this animal from its cinematic role in the movie, Jurassic World. 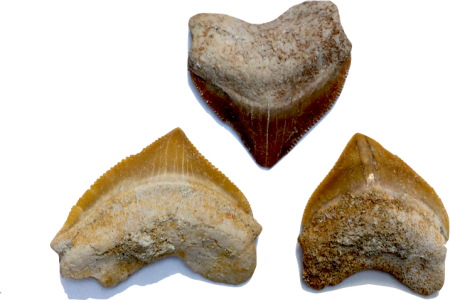 Like the Elasmosaur fossils, you may find fragments of Mosasaur teeth in your Treasure Quest mining rough on rare occasions. 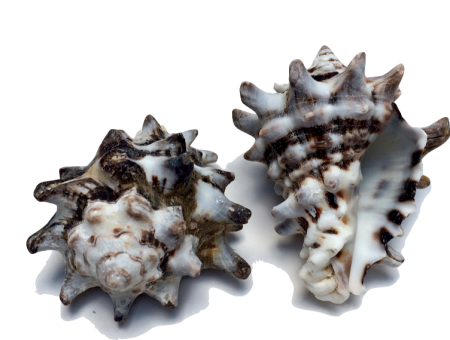 Murex – This family of shells is frequently collected for their beautiful, ornamental shell. 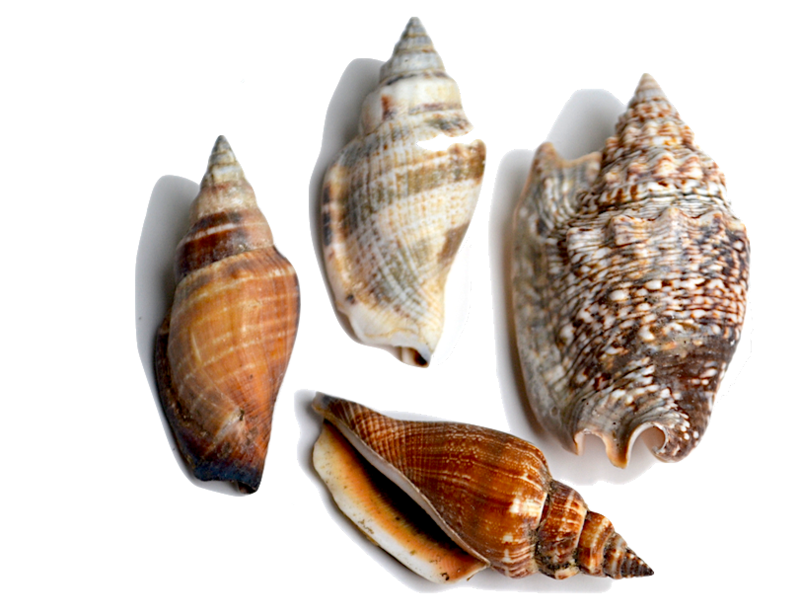 You will also find these shells used in the hermit crab hobby. Nassa – This family of gastropods includes a large variety of small animals of varying color, patterns and ornamentation. They are found worldwide foraging in sandy places. The size of this family makes it challenging to identify the specific species. Nerite – The name of this small species of snail is derived from the name, Nerites, who was a sea god in Greek mythology. The story of Nerites includes the boy being changed into a shellfish and then restored back to his normal form. 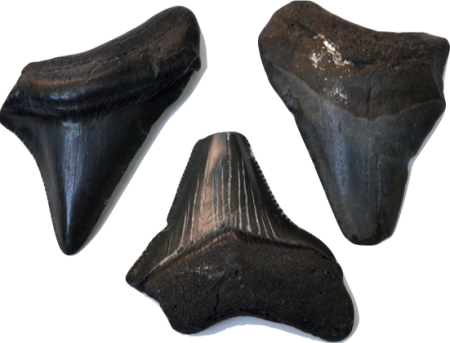 Otodus Tooth – Otodus obliquus is an extinct genus of mackerel shark which lived 60 to 45 million years ago. Believed to have reached 30 feet in length – one and half times the longest great white shark. An ancestor to the Megalodon. 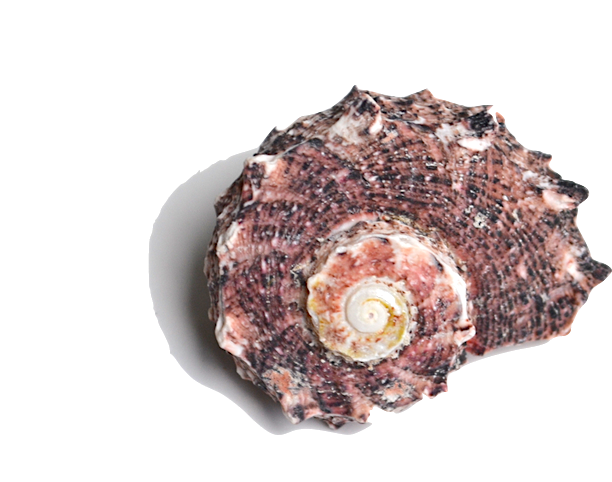 Propeller – This bivalve’s shell’s look similar to an aircraft’s propellers, hence their name. 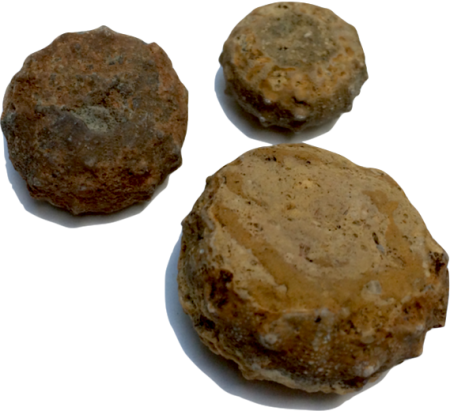 Sand Dollar – An urchin, this echinoderm crawled the sea floor with tube feet and burrowed in the sand to find food. 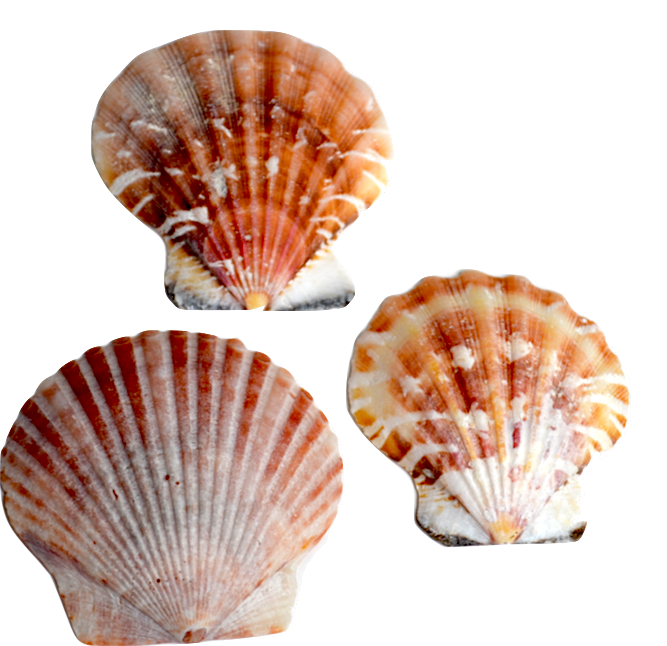 Scallop – This is a family of bivalves is distinctly characterized by its fan-shaped, ribbed shell with “ears” on either side. Most scallops are free-swimming and do not attach to a substrate, allowing themselves the ability to escape from a predator by using jet-propulsion to swim backward. Scallops do produce pearls although they are not as pretty as those made by their oyster cousins. 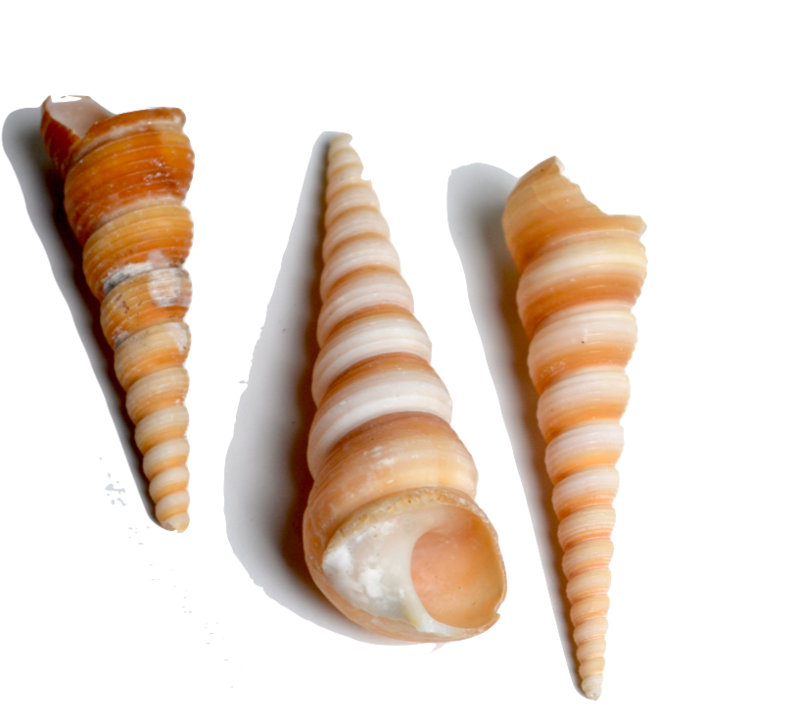 Screw Shell – Collected for their unique shape, screw shells, also known as Turritellas, have a prominent spiral that sets them apart from other gastropods. They are also called “tower shells” and are known for burrowing into the sandy ocean floor. 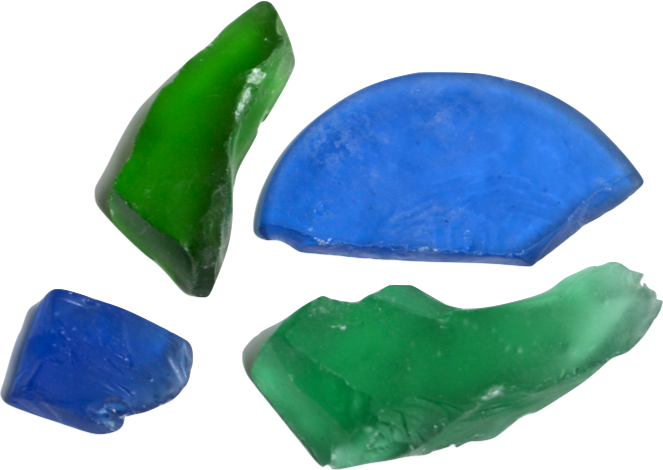 Sea Glass – A beachcomber’s favorite – sea glass starts off as a piece off of a broken bottle and is worn smooth over decades by continuously being tumbled in the ocean. It can take 20 to 50 years to achieve a smooth, round and frosted appearance which is prized by collectors. Hint: our sea glass is mechanically tumbled and is created under a much faster timeframe. 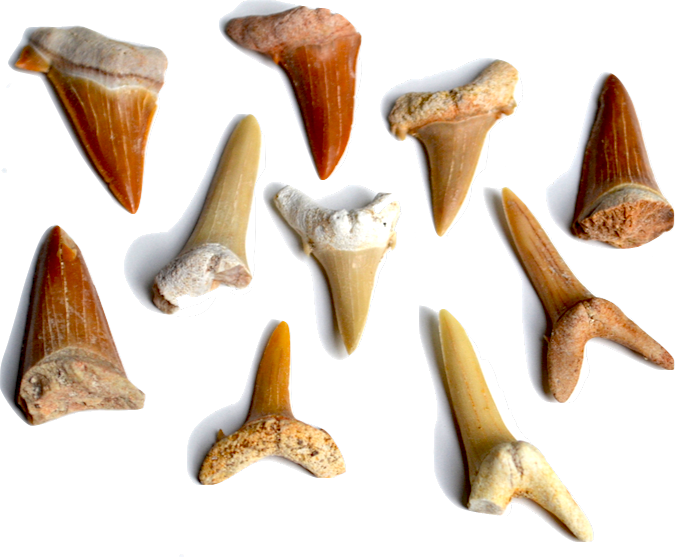 Sharks’ Teeth – Our sharks’ teeth come from the Sahara desert in Morocco. The region was once underwater and was a prolific marine habitat. 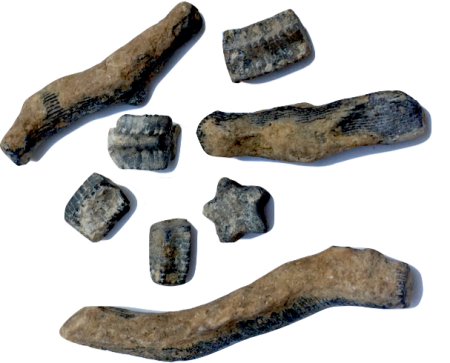 The teeth found in your Treasure Quest mining roughly date from the Paleocene (66 – 56 million years ago) through the Eocene periods (56 – 33.9 million years ago). 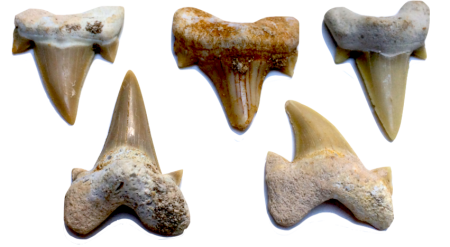 You will predominantly find teeth from the Sand Tiger shark, but will also find teeth from the extinct Otodus shark on very rare occasions. The Otodus pre-dates the Megalodon and is believed to be the direct ancestor of the largest shark to have lived. 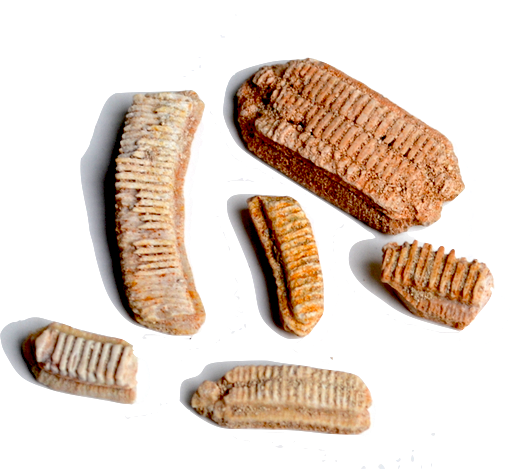 Stingray Plates – These fossils are of a stingray’s mouth plates used to grasps and crush their food. Squalicorax Tooth – Also called the Crow Shark, this animal reached 15 to 16 feet in length and had triangular, flattened teeth. They lived 100 to 65 million years ago. The name is derived from Latin and Greek terms meaning Raven Shark. Top – Also known as cone-shaped top, these animals are in the same family as their smaller cousins, the button top. They can be found in a variety of colors including emerald green and rosy pink. Turban – The turbans have a distinct shape that sets them apart from the rest. In addition to their unique shape, they often have a pearlescent interior and are commercially harvested for their mother of pearl. Urchin – The sea urchin is a type of echinoid made up of rigid plates with small pores for their tube feet. They crawled the sea bed, burrowing in the sediment, to forage on algae. Urchin Spines – The urchin’s shell was covered in protective spines, helping it to survive from predation. Vase – These carnivorous snails build a heavy, thick protective shell covered with spines. Sought after by collectors, Vases are a beautiful addition to any collection. Vertebrae – From time to time you will find fossilized fish or shark vertebrae in your Treasure Quest mining rough. 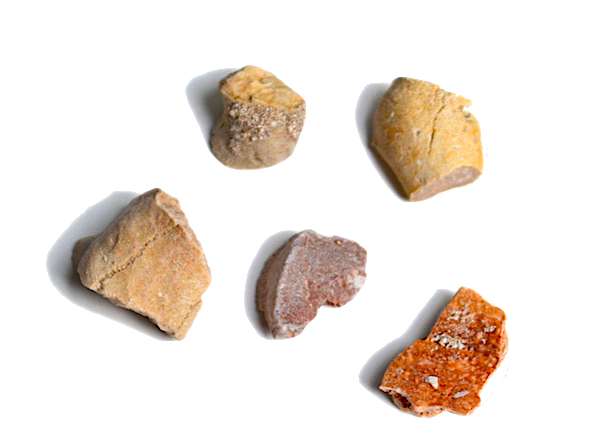 These pieces roughly date from the Paleocene (66 – 56 million years ago) through the Eocene periods (56 – 33.9 million years ago).